The Yangtze River is the longest river in Asia and the life blood of China with nearly a third of China’s population living within its basin area. The river bisects the country and runs 6,380 km from the high Tibetan plateau in the west to the East China Sea at Shanghai in the east. The cruises start from the city of Yichang in central China and heads inland upriver. The first port of call is the Three Gorges Project. 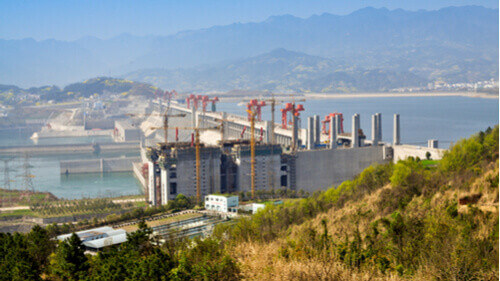 Arguably the largest construction project on earth and certainly the biggest hydro-electric power station in the world, the Three Gorges Dam spans the length of the Yangtze near Yichang. Although somewhat controversial when it was built for displacing over a million people, and the ecological impact it made, it is thought to provide as much as 10% of the country’s power needs, significantly reducing the need for coal burning power stations. At the start of the cruise there is a visit to the Dam to learn more and an optional visit to the Tribe of the Three Gorges – one of the only remaining scenic spots not affected by the Dam project. 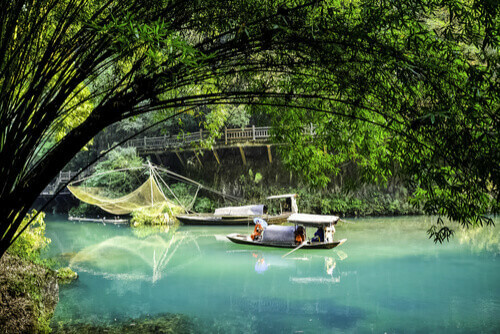 The cruise goes on to pass some breathtaking landscape including the Shennong Stream and the stunning Mianzhu Gorge, where Hanging Coffins can be seen, that contain the remains of the Tujia people. It is from these gorges that many ancient shanshui – or ink wash paintings – of gorges, rivers and mountains were painting by ancient masters, that hang in museums and temples around the world today. It continues to the ancient city of Fengdu, known as Ghost City, a complex made up of shrines, temples and monasteries dedicated to the dead. 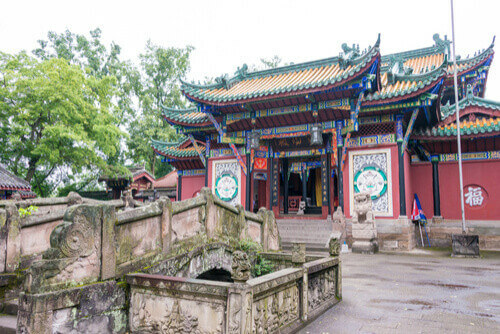 An incredible 48 temples from various eras and in different architectural styles have been built here over the centuries, including the most famous Hall of the Jade Emperor – a temple dedicated to one of China’s mythical founders. 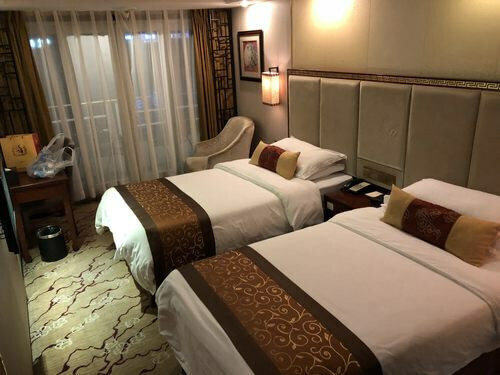 The cruise continues up the river with a number of other optional stops and excursions until it gets to Chongqing where, after a farewell banquet, guests disembark. You’ll be staying on a Yangtze Gold 6 or similar ship. The rooms here are all at least 24 sq m and have two single beds or a double bed. All rooms have a balcony, air-conditioning, a safe and a refrigerator. Hot water thermos flasks are in each room as are a limited amount of bottled water. The voltage in the cabins is 220v. Yes, all meals are included and there are further places to buy other snacks on the ship. Breakfast and lunch are served buffet style with mostly western dishes, while dinner is a Chinese meal. For those that prefer western dining in the evening, a VIP dining option is available that has more western dishes on offer. A reminder to never drink the tap water either on the cruise ship or anywhere in China. Bottled water is cheap and accessible everywhere. Although the cruise ships have limited Internet access, the Wi-Fi is very patchy and certainly not to be relied on but it works best in the lobby and it is free. Why not enjoy a few days unplugged instead. From welcome parties to fashion shows, film screenings and lectures, Tai-Chi classes to karaoke – there is a wide array of entertainment options on offer with a full schedule provided to you upon arrival. There is also a gym, swimming pool, a spa, a library and a variety of small shops too. What about payments and tips? Major credit cards are accepted on the cruise ship and most purchases will be put on your cabin bill and paid for upon checkout. Generally, in China it is not necessary to tip excessively but a tip of around 150 RMB (AU$31) paid upon checkout is appreciated. This is then pooled and shared between the staff.